Sleek, with a dropped frame for better stability, Early Rider balance bikes are the rides for future road racers. 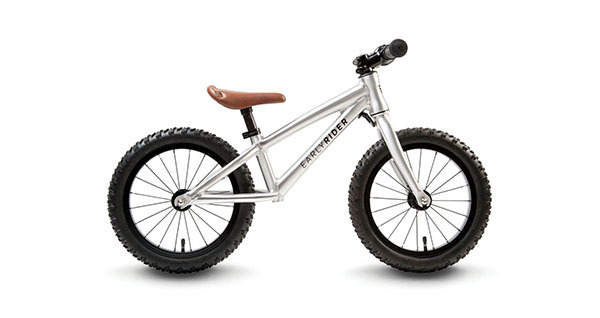 Built for kids aged three to five years, the Road Runner 14″ ($275) has everything a kid needs for a smooth ride. The angled diamond frame makes pushing off easy, and the dropped handlebars help kids redistribute their weight downwards for better balance. For kids keen to get really muddy, the Trail Runner 14″ ($275) is the mini mountain bike of choice. The knobbly tyres are great for rugged all terrain riding: the muddy puddles at the park, the gravel driveway, and all the other places kids can get really filthy. The whole kit make these bikes look like the cool little sisters of the hipster fixie. The frames are brushed chrome, the saddles cognac faux leather and the handlebars are wrapped in black. These bikes may be for beginners, but they’re anything but babyish. Early Rider bikes are carried in bricks and mortar shops around the world. In Sydney, Town Bike Pitstop stocks Early Riders and if you’re not in Sydney, check the stockist page for your local.